The Hartford, West Hartford, East Hartford metropolitan statistical area ranks behind only St. Louis, Austin, Texas; and Providence in the percentage of female-owned startups. About 31 percent of startups were owned by women, according to an analysis by Seek Business Capital, a Los Angeles financial firm that makes loans to small businesses. While startups owned by women are increasing, just 24.5 percent of new startups are owned by females, according to the Census Bureau’s Annual Survey of Entrepreneurs. Women own approximately 20 percent of all businesses nationwide. 10. Baltimore: 28.3 percent of startups owned by women. 9. Salt Lake City: 28.6 percent of startups owned by women. 8. Washington, D.C.: 29 percent of startups owned by women. 7. Kansas City: 29.1 percent of startups owned by women. 6. Indianapolis: 29.7 percent of startups owned by women. 5. San Diego: 30.5 percent of startups owned by women. 4. 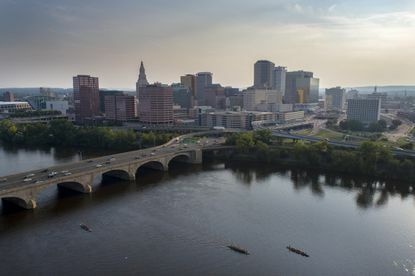 Hartford: 30.8 percent of startups owned by women. 3. Providence: 30.9 percent of startups owned by women. 2. Austin, Texas: 32.7 percent of startups owned by women. 1. St. Louis: 45.2 percent of startups owned by women.